AND a few stray thoughts for yet another Saturday. For a Saturday following the week when Chief Minister Manohar Parrikar was back at Bappa’s Gaddo near the Alankar Cinema. For a Saturday following the week when Manohar Parrikar’s boast of zero tolerance for corruption was dented by his inducting Mauvin Godinho and Vishwajit Rane into the cabinet. For a Saturday following the week when the police launched a crackdown on matka and arrested over a hundred dealers in a single way. For a Saturday following the week when the Election Commission (EC) suspended the bye-election in RK Puram in Chennai though it did not take any action against Pandurang Madkaikar for a similar offence. For a Saturday following the week when Michael Lobo took strong objection to the demand by Maharashtrawadi Gomantak Party (MGP) for a ban on animal slaughter in Goa. For a Saturday following the week when I was reminded of the Easter celebrations in London over two decades ago. AND a few stray thoughts on Parrikar, the chief minister, returning to his favourite gaddo near Alankar cinema. The same gaddo which he had denied visiting when Tara Natayan, my better three-quarters, wrote about how he was eating in unhygienic gaddos when there was a jaundice epidemic in Panjim which was liable to spread to the rest of Goa. This was way back in 2003 when the drinking water pipeline of a hotel in the heart of Panjim got mixed up with sewage leading to an outbreak of dengue. All the restaurants in Panjim, including popular ones like Bhosles, were shut down. Even the gaddos selling panipuri in Miramar were closed. This was when we were told that the chief minister was in the habit of visiting on a daily basis a gaddo near Alankar cinema for his ros-omelette late at night. We went to the Alankar cinema and spoke to his favourite ros-omelette suppliers. He told us that he often kept his gaddo open till late for Manohar Parrikar. When Tara carried a report on the chief minister eating at a unhygienic gaddo when there was jaundice epidemic, Parrikar called up early in the morning denying he ever went to the gaddo. When we had told him we had proof, he insisted he went there sometimes to drink coconut water. The same morning he called up the owner of Herald Raul Fernandes and directed him to stop Tara from writing in the Herald. It is no doubt nostalgia that has taken Parrikar back to Bappa’s gaddo. A picture of him looking very happy at the gaddo has been posted on Facebook. 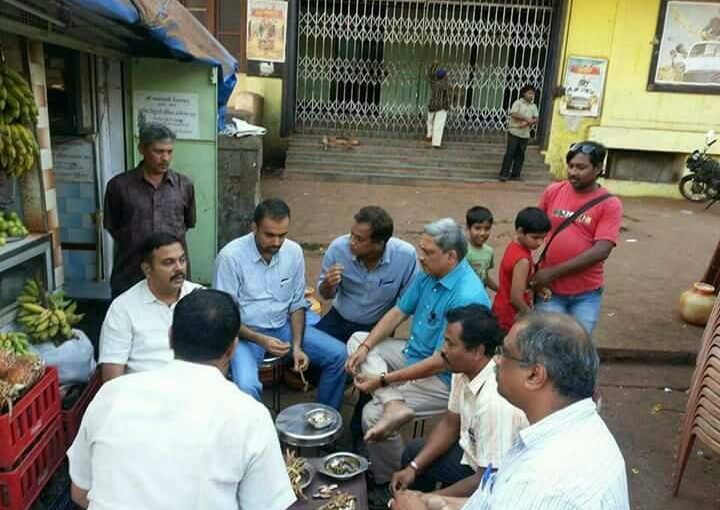 Parrikar is free to eat wherever he wants. We are, however, naturally concerned about the chief minister’s health. Particularly after the mysterious illness and death of Tamil Nadu Chief Minister Jayalalithaa, apparently due to food poisoning. Does Bappas gaddo have a licence from the Mapusa Municipality? More importantly does it have a licence from the Food and Drugs Controller? Since all of Goa is relying on Parrikar for development, good governance and creating jobs for Goan youth we want him to be healthy and fit. AND a few stray thoughts on Parrikar’s reputation for zero tolerance for corruption. While Parrikar has always prided himself on his personal honesty he has permitted his political allies to be as corrupt as they wanted to be. Tolerating massive corruption by cabinet colleges is worse than being corrupt yourself. During his first tenure as chief minister, Manohar Parrikar lured Babush Monserrate to extend support to him and rewarded him with the portfolio of Town and Country planning. The result was the diabolical Regional Plan (RP) 2011 which sought to convert Goa into a concrete jungle and was scrapped because of a public agitation by the Goa Bachao Abhiyan (GBA). Thanks to Babush, Parrikar had to give up his ambition of creating the corporation of the city of Panjim, as Babush insisted that Taleigao would be de-linked from the CCP and would revert to the status of a panchayat. Parrikar was so dependent on the crooked and corrupt Babush that he sanctioned a separate planning and development authority only for Taleigao panchayat. History repeated itself on Wednesday with the two of the most corrupt politicians in Goa being inducted into the Parrikar cabinet to fill up the two remaining vacancies. Mauvin Godinho who switched to the Bharatiya Janata Party (BJP) much before the elections and contested the Dabolim seat on the BJP ticket and won, was accused of abetting power theft by Parrikar himself. Back in the late 90s when Mauvin was the Power Minister in the Congress government headed by Pratap Singh Rane he had defied the cabinet decision not to extent power rebates to steel rolling mills. Parrikar who was then in the opposition filed a complaint against Mauvin which was upheld because it was backed by the then chief minister, Rane. Subsequently when the BJP extended support to the Saldinha Government of which Mauvin was a part, Parrikar tried to withdraw his complaint. He was not allowed to do so and the matter is still pending before the Supreme Court. There are also charges of disproportionate assets and cheating the Sancoale Communidade against Mauvin. This is the man that the honest Parrikar included in his cabinet on Wednesday in preference to the six Catholic BJP MLAs who are waiting for a kodel. The other minister that Parrikar inducted into the cabinet on Wednesday, Vishwajit Rane, is a bigger chor than Mauvin Godinho. Vishwajit, which means “winning the faith” betrayed the faith of the Congress and his father, a veteran Congressman, to resign from the Congress, on whose ticket he was elected MLA and joined the Sangh Parivar. It is for this vishwasghaat that Vishwajit was rewarded by Parrikar. The logic is that the party is worried that it is losing its support among the Hindu community. Ironically seven of the 13 MLAs elected on the BJP ticket this time were Catholics. Vishwajit Rane and his father have control over the Valpoi and Bicholim talukas where their candidates have always won. By giving Vishwajit a cabinet seat and a licence to loot, he has ensured that the BJP will get four seats at least. Also do not trust the father, Pratap Singh, who extended his blessing to Vishwajit to join the BJP, despite claiming to be a lifetime Congressman. Senior Rane was always a part of the Sangh Parivar having started his career in the MGP as Revenue Minister. Vishwajit Rane was accused of generously spending Goa Tourism Development Corporation (GTDC) funds on himself when he was appointed chairmen by the Parrikar government. Vishwajit’s travel and mobile bills were more than the profits of the GTDC. When Vishwajit became an MLA and a minister in the Digambar cabinet, he milked the Goa Medical College (GMC). A lot of expensive equipment was bought, for which he got a commission. He is reported to have told the then dean and heads of department that he had no objections to their making money as long as he got his commission. Vishwajit struck a deal with a leading pharma company which supplied insulin and got lakhs of Goans addicted to insulin whether they had diabetes or not. He outsourced the pathology work with the GMC paying for only the reagents, which is why the Head of Department of Pathology in the GMC can spend his time loafing around the world attending conferences because he does not have the responsibility of running the pathology department. In sharp contrast the preventive medicine department is headed by a maniac. Vishwajit Rane is responsible for the present state of the GMC. Young Rane destroyed discipline in the GMC. He hired hundreds of class three and class four staff from Valpoi and Poriem the constituencies from which he and his father were elected. None of the young Rane’s candidates were qualified for the jobs, and worse still, would not do any work. Even the Dean has no control over them because they would claim that they were Baba’s people and therefore not expected to work. I myself have experienced the arrogance of young Rane’s boys and girls in the GMC. One of them was attached as a peon in the Dean’s office. When I went to the Dean’s office as I had a spinal problem and wanted an MRI done, the Dean gave young Rane’s peon a note and told him to take me to the MRI Department. When we came out of the Dean’s room the Rane peon asked one of the other peons to do his work. When I objected, he told me that he could not take me to the MRI as he had never stepped out of the Dean’s office and did not know where the MRI rooms were! The Dean’s driver appointed by Rane would turn up late or remain absent but could not even be issued a memo as he was Rane’s person. Rane also outsourced the cleaning of the GMC to a private party even though the GMC had its own cleaning staff. AND a few stray thoughts on the EC cancelling the bye-election to the RK Puram constituency on the charge of large-scale bribery. The bye-elections were held due to the unfortunate death of Tamil Nadu Chief Minister Jayalalithaa and were being seen as a battle of supremacy between the two warring AIADMK factions, one of which is led by Sasikala who is in jail in Bangalore after being convicted by the Supreme Court in a disproportionate assets case. The Sasikala-led faction candidate is her nephew, party Deputy General Secretary TTV Dinakaran. He is alleged to have bribed voters with `2000 notes. The EC claim that they found evidence of over `10 crore being distributed to voters in the bye-election, which is also being contested by Jayalalithaa’s niece. It may be recalled that the government was hijacked by Sasikala, who claimed to be a close friend of Jayalalithaa. Presumably Sasikala also stole the 10,000 sarees and 8,000 pairs of shoes of Jayalalithaa besides 200 kgs of gold. All candidates in the bye-election were accused of bribing voters. Many of them followed Modi’s advice on digital transfer. Some transferred funds to voters using Paytm. Others deposited money in the accounts of voters using National Electronic Fund Transfers (NEFTs). Some of the candidates bought phone recharge coupons, newspaper subscriptions, and milk tokens, and distributed them to voters. Though the EC has cancelled the RK Puram bye-election because of corruption, it did not take any action against Pandurang Madkaikar who quit the Congress and contested the election on the BJP ticket. Madkaikar was accused of buying tokens worth `20 lakhs, which is the limit for election expenses, from the Goa State Co-operative Federation which is headed by North Goa BJP MLA Narendra Savaikar. Clearly the EC has a different set of rules for BJP states. AND a few stray thoughts on the crackdown on matka which is the poor man’s casino. Matka has been around for over 50 years at least and is mostly operated by dons in Mumbai. The name matka comes from the fact that all the numbers from one to 99 on which bets are placed are put in a matka and shaken. The don than removes the winning number which is announced twice a day. Almost everyone in Goa is a matka agent as you only require a table and a matka slip. Every office has a peon who takes matka bets. The system is so well managed that if the number wins you are paid immediately. There is never been a case of default by a matka agent as this can be fatal. The reason why the BJP government has started a drive against matka is because it is allegedly controlled by the former Congress MLA of Siolim Babu Kavlekar. The big matka prince in Panjim is reported to be Yatin Parekh, former mayor and close friend of Babush. In contrast the BJP refuses to take action against the casino owners because they have the blessing of senior BJP leaders in Delhi. In 2002 when Parrikar was sworn in as chief minister, Jaydev Mody of the Deltin group was seated in front with LK Advani who was then the BJP chief. During the recent swearing in, once again Jaydev Mody was seated next to BJP President Amit Shah. Forget banning casinos, Parrikar has gone back on his promise to remove them from the Mandovi river, despite opposition from Revenue Minister Rohan Khaunte. At the first cabinet meeting there were fireworks as Goa Forward (GF) also wanted casino licenses cancelled. However, the Goa Government is so dependent on casinos for revenue after the suspension of mining, that the casinos were given a six month extension. Also, a sixth offshore casino, owned by a politician who is in jail, has been permitted to berth in the Mandovi river. AND a few stray thoughts on Michael Lobo challenging the MGP’s demand that cow slaughter be stopped in Goa. This was aimed at both the Catholic community, for whom beef is a favourite as beef is the cheapest meat available in the market, and the Muslim minority, a growing population of 14 per cent who believe in sacrificing goats and cows during Bakri Eid. The MGP made the statements in the context of a demand from RSS Chief Mohan Bhagwat for a ban on beef all over the country. UP Chief Minister Aditiyanath has started a rule of terror in UP where even dairy farmers have been attacked by so called cow protectors. Fortunately the Supreme Court has made it clear that the right to eat what you want to is part of fundamental rights. Michael Lobo has pointed out that since Catholics account for 30 per cent of the population and more than half of the BJP MLAs, no ban on beef will be allowed in Goa. AND a last stray thought for yet another Saturday. I remember spending the Easter week in London in the early ‘90s. The hot cross buns were really fresh and hot, and the Easter eggs were of real chocolate and melted in your mouth. Moreover, if you wanted to gift an Easter egg, you could get the name of the person you wanted to gift it to carved with marzipan on the egg. The Easter egg symbolises fertility and the rebirth of Jesus Christ. It coincides with the resurrection of Jesus Christ after his crucifixion and burial, and is the most important festival for the Catholic community. We wish all our readers a very happy Easter. Previous post: NO BACK-DOOR BEEF BAN!